Powered by a ¾ hp, high torque, low amp motor. 1/3 hp discharge pump, capable of pumping 38 gpm. 1” suction and discharge hoses. Supplied with a 20’ GFI protected 12 gauge power cord. 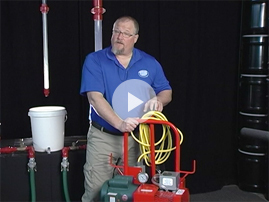 The Dropmaster DM12 provides a significant competitive advantage for fire protection contractors when replacing sprinkler heads or making repairs. The Dropmaster DM12 is the perfect product that allows sprinkler heads to be replaced safely using DM12’s patented siphoning system. Contractors report labor savings of 40%-60%, meaning more productive hours for the contractor and less idle time for their clients. Designed and built for 24/7 operation. Safe for use with most antifreeze solutions. Can be used on domestic, mechanical and process pipe. Factory tested and approved for Uponor Pex type a. Mounted on wheels to be 100% portable. For mechanical contractors, the time will come when boilers, heat exchangers, chillers, air handlers and process piping need to be repaired or replaced. 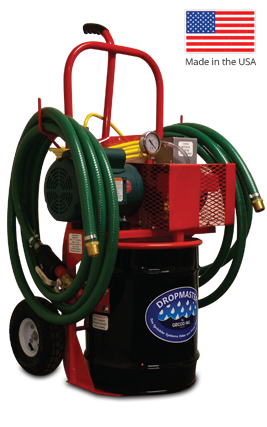 The Dropmaster DM12 removes residual water, odors, and most antifreeze solutions prior to repairs, change outs, and winterization. DM12’s totally portable system increases productivity, enhances profits and reduces liability. 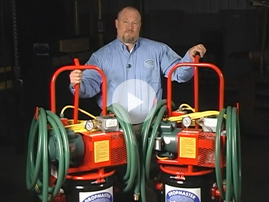 Every Dropmaster is durable, built to last and comes with a one year warranty. Gecco’s Dropmaster will help mechanical contractors provide their clients with efficient energy systems that run at their fullest capacity. 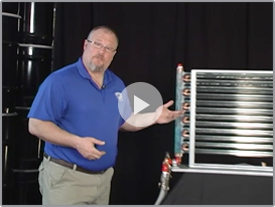 Removes contaminants and debris from refrigeration lines. 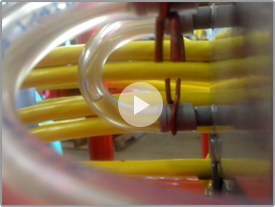 Can be used on a variety of closed loop piping systems. Transport your DM12 easily with the DM12 Hitch Mounted Carrier with a built in ramp and locking mechanism. 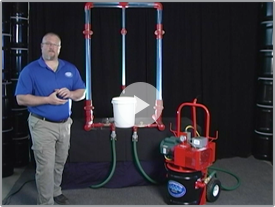 To learn more about the DM12 please watch the videos below.